In 1965, Simon and Garfunkel were on hiatus, having released their first album Wednesday Morning, 3 AM to just 3,000 purchasers. Simon played the troubadour in England, performing solo in coffee shops and small clubs. He recorded The Paul Simon Songbook for CBS Records in a single session with just one microphone on both guitar and vocals. The album included songs that would later become S&G staples, leading some to retrospectively dismiss it as just “demo versions” of those songs. The album sank without a trace, and Simon was reportedly unhappy with its poor audio quality; he refused to allow its re-release even after Simon and Garfunkel became successful. Sometime in the past year, iTunes released a “Mastered for…” version of the album with no fanfare. It’s wonderful. 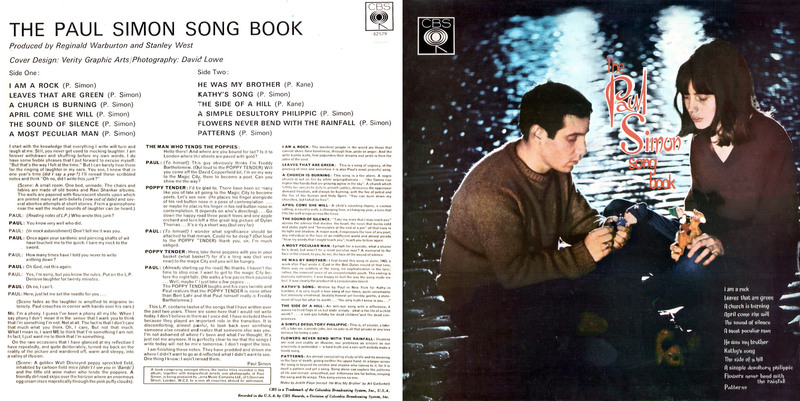 Paul Simon’s liner notes on the original release state, “I start with the knowledge that everything I write will turn and laugh at me.” He continues, “This LP contains twelve of the songs that I have written over the past two years. There are some here that I would not write today. I don’t believe in them as I once did. I have included them because they played an important role in transition. It is discomforting, almost painful, to look back over something someone else created and realize that someone else was you. I’m not ashamed of where I’ve been and what I’ve thought. It’s just not me anymore. It is perfectly clear to me that the songs I write today will not be mine tomorrow. I don’t regret the loss.” Ah, youth. A Church is Burning might be a textbook anti-Dylan Dylan song. The lyrics compare the flames rising from a burning church to hands lifted in prayer – at once lovely and naive, and entirely optimistic (something Dylan was never accused of.) April Come She Will features lovely guitar, and what some might call childish lyrics (that’s basically the point – it’s a kid’s rhyme.) Next is The Sound of Silence, which also appeared on Wednesday Morning, 3 AM, and turned out to be the song that broke Simon and Garfunkel to the world. Producer Tom Wilson, inspired by the folk rock sound of The Byrds, used the band from Dylan’s Like a Rolling Stone to dub a new backing track on the song; when Simon first heard it, he was horrified (rightly so). The rendition on The Paul Simon Songbook might be the best version ever released of this masterpiece. The lyrics are astonishing, predicting Ronald Reagan’s America twenty years before the fact. Simon stomps his foot in time with the music; it’s an angry, gritty song. A Most Peculiar Man also benefits from Garfunkel’s absence. The song is a quirky poem, too cute in its more-familiar version on the Sounds of Silence album. This one is lovely and heartbreaking. He Was My Brother is another surprisingly optimistic protest song, cousin to A Church is Burning. I doubt anyone would credit Simon with these songs, even fans long familiar with S&G. This one also appeared on Wednesday Morning, 3 AM, but again, I prefer this interpretation. Somehow, the absence of folky harmonies prompts one to reconsider the song’s content. Simon’s fingerpicked guitar on this song is among his best recorded work. In retrospect, Simon was right that he brought a lot to Garfunkel’s career, even if he was inelegant in conveying the message. For Emily, Wherever I May Find Her is a peerless love poem that Garfunkel was able to send soaring (find a live version); likewise, it’s hard to imagine Bridge Over Troubled Water without Garfunkel’s lead (my friends and I were convinced that the song’s bridge was about shooting heroin: “Sail on, silver girl…”) Simon could be a jerk. I saw him in Cooperstown on the Fourth of July, and he responded to an audience request with, “I’ll play. Whatever. I want.” The Paul Simon Songbook, once again available and indisputably better than ever, makes some of that bitter history beside the point. Trust me: these songs are all about the music, and this collection stands as the strongest album Paul Simon ever released, bar none. Posted in Music and tagged Music Reviews. Bookmark the permalink. I finally concluded that what LB (probably) meant was that, in the 1960s, the jazz and classical worlds were not breaking any new creative ground. With respect to their own traditions. But as we both know, the 1960s is revered by many as a “golden age” for creativity in the rock world. Has PS performed in Cooperstown on multiple occasions? One of our day-trips accidentally coincided with him being there. (But I don’t think it was on the 4th). And because we didn’t need to stand in an entrance line, we were able to properly position ourselves to hear his warm-up set. Some days you live right! I’ll agree there was more growth happening in rock during the 60’s, if not more creativity in general; this seems to be what you’re driving at. I’ve never thought about Paul Simon as underrated – you might have a point. Certainly people want “the hits” instead of his restless development – The Capeman was a Sondheim-esque musical that sank without a trace. Graceland is amazing, but I like Rhythm of the Saints better, and my favorite album (after Songbook) might be Hearts and Bones. So Beautiful or So What is also fantastic. I tend to alternate between thinking of him as a pop genius without equal (combining voice, guitar playing, music and lyric composition) and… some other state of opinion. Right now I’m high on him. Simon played Cooperstown on the 4th of July, 2006. I caught a lot of heat from Sarah, 6 at the time, because we missed fireworks. He didn’t mention the holiday, as I recall, and there weren’t even fireworks close by that we could see. I don’t know if he was there before, or since.